Another lie-in, this time to midday. L wanted to give her ankle a break (of the unbroken kind) and this is clearly the best way of giving it a rest, doing something not load bearing. I tentatively suggest that this is perhaps also a good chance to stretch the wheels of her bike (puts on tin hat). So later L cycles to Harvey Hadden, does the bike track there and then the gym. I walk the boys on the park, again and again without balls. They are seriously starting to wonder if something is up. In the evening we head to Broadway for our second film in two days. Now here's a quirky one. 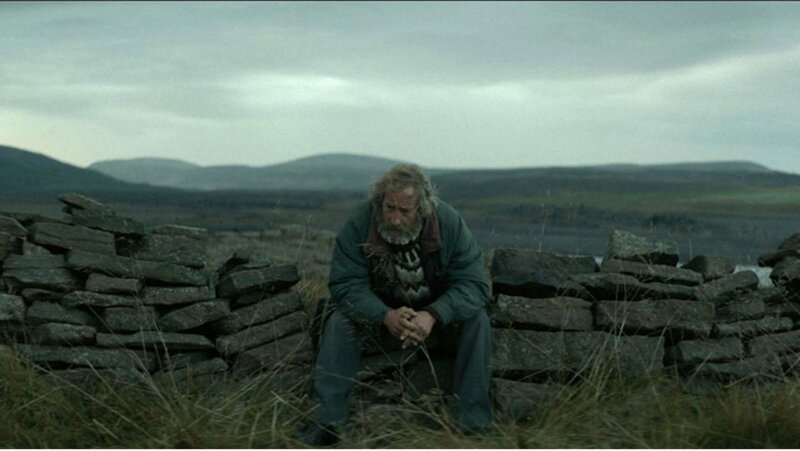 Rams is a snapshot of life in a remote Icelandic valley, an environment so harsh that seemingly only sheep and stubborn bearded old men can survive there. The stubborn bearded old men are two brothers, Gummi (Sigurður Sigurjónsson) and Kiddi (Theodór Júlíusson). They live in neighbouring farmhouses but have not talked for forty years. Their only form of communication is the occasional written note which is delivered by border collie. 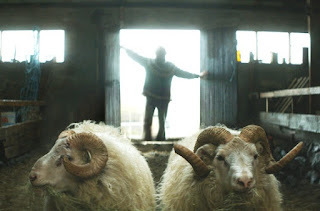 The film starts with them going head to head in the competition for the most highly-prized ram. Kiddi wins with Gummi coming second. Kiddi’s celebrations are brief though when it turns out that the winning ram has scrapie. The outcome being that all the sheep in the valley will have to be slaughtered. Kiddi refuses to comply with the slaughter. So he is arrested, his flock is forcibly destroyed and he goes on multiple drunken benders. Twice we see Gummi reluctantly forced to save his brother when he finds him lying motionless in the snow, drunk and about to freeze to death. On one occasion he scoops him up in his tractor's front loader and deposits him in front of the nearest hospital. Gummi meanwhile kills his sheep himself against regulations, so that he can secrete a few ewes and his prize ram in his basement. At first he gets away with this but eventually they are discovered by the authorities. When Kiddi learns what his brother has done, they start to become reconciled. Kiddi helps Gummi re-hide them and then when that doesn’t work, the two of them combine to drive them off into the mountains during a blizzard. A plan which doesn’t go too well due to the inclement weather, this time leaving Kiddi trying to return the lifesaving favour and attempt to save Gummi. Quirky but excellent. Well worth seeing. Afterwards we go for a few pints (rather appropriately maintaining the sheep theme) in the Golden Fleece on Mansfield Road, which has recently become Flipside’s second pub. Then it’s the traditional Sunday Indian.